I’m no big fan of the quick fix. If you know me, you know I advocate for making good choices every day, creating sustainable lifestyle shifts, that last for the long term. It’s an evidence based, results-driven perspective and it really works. However, I do recommend the right kind of detox, at the right time. If you are feeling the detox itch after a long summer of a few too many beachside cocktails, backyard BBQs, and vacation-mode eating and drinking, then seize that impulse to take better care of yourself and do a hormone detox. Many health issues – including fatigue, acne, depression, anxiety, brain fog, mood swings, and weight gain (the kind of things that make you want to do a detox in the first place) are down to too-high estrogen levels or a condition we call “estrogen dominance.” Estrogen dominance drives the most common hormonal health issues too, from PMS to PCOS. Detoxing your body of excess estrogen has many immediate and long term benefits. If you feel the need for a detox it’s likely because your liver is running at a sub-optimal level, it’s overloaded with caffeine, alcohol, pesticides, sugar etc and you are sensing the need to cleanse. A detox is not a crash diet, juice cleanse, or fast – that won’t achieve the goals you’ve set out. 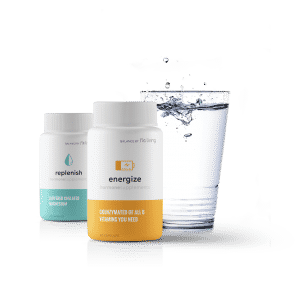 If you want to feel energized, refreshed, boosted in body and spirit, as well as lose a few pounds and get glowing skin – you need nutrients, minerals, and resources to make this happen. Your liver needs the fuel to process the excess hormones and toxins and eliminate them from your body. 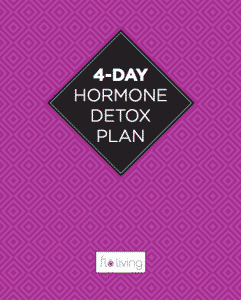 The 4 Day Hormone Detox is packed full of cleansing foods that address your liver, intestines and lymphatic system. Your elimination organs – especially your hard-working liver – need lots of nutrients to breakdown toxins, and you get nutrients from food. You do not and will not get enough nutrients from a juice fast or cabbage soup diet for your body to detox! There are so many good reasons to do a hormone detox – acne, bloating, sore breasts, PMS, funky periods, feeling sluggish, unable to focus, lacking creative juices – but I want to tell you how my 4 Day Hormone Detox can make you feel. Because sometimes the problem isn’t enough to prompt us to take action, perhaps because you’ve been living with it so long it feels like nothing will work. Sometimes you need some positive inspiration! If you’ve tried detoxing before and it just hasn’t worked out the way you wanted, this post is for you. Read on to hear what you need to make detoxing not just something you live through, but something you look forward to! In fact, many of my Cycle-Syncers do this detox once every few months. Your skin will glow – during the 4 days of the hormone detox you will eliminate entirely all the central adult and hormonal acne triggers like dairy, soy, caffeine, sugar, and gluten. You will also increase the amount of skin-clearing, hormone-supportive nutrients in your diet – especially the vital omega-3s and B vitamins. Excess estrogen and the resulting hormonal imbalance leads to acne by increasing sebum production and preventing skin healing. If you are particularly prone to acne around your ovulation days or before your period, this detox is for you. Your mood will soar – if you’ve been experiencing anxiety, low mood, depression, or just a sluggishness and demotivation, then this detox will turn that around in 4 days. You’ll feel emotionally lighter, as well as physically lighter. The root cause of mood swings and many female-centric mood problems is destabilized blood sugar. This detox is not a fast, will not leave you hungry in the evening, and should keep you satisfied and stable throughout the day. Most women experience their worst moods as a form of PMS, which is the result of high estrogen/low progesterone – this detox will sweep your body of that excess estrogen and leave you in balance. You’ll be eating lots of B6-rich foods and B6 is the progesterone’s favorite micronutrient. You will shift your relationship with food – after 4 days you’ll no longer feel bloated and, it’s very likely, you’ll lose a few pounds. With excess estrogen many women store weight round their middle. For my detox you will be eating anti-bloat ingredients in your fruit salads and green salads at every meal, plus you will be eliminating many sources of weight gain – sugar, caffeine, dairy. But, and I feel more importantly, you will also shift how you feel about food. The detox includes guidance on how to approach your detox foods, not just from the practical point of prepping meals, but from how you actually engage with and enjoy that food. The aim is to give you pause about how you may have related to food up to now – perhaps that’s eating standing up, with the fridge door open, on-the-go, off your kids’ plates etc. There will be lessons you can carry with you beyond the 4 days. You’ll feel creative and calm – during the detox, you’ll have prompts for how you can process your experience at the end of each day. You’ll be journaling on specific topics that aim to expand your perspective, increase your sense of confidence and calm, and support you in connecting with your feminine energy and creativity. This will be a conversation with yourself and your body that will help you get so much out of this mini-retreat. A detox can be a transformational experience. You can use that energy to make positive changes in your life long term. The clarity of thinking and focus you’ll attain will help you to hone in on exactly what you want in all areas, personal and professional. You’ll detox more than your body – my detox has an additional layer that you won’t find with most detox plans. 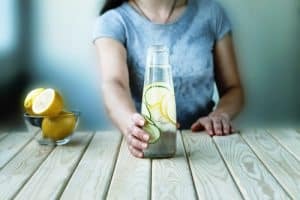 You won’t only be detoxing your diet and concentrating on what you eat during the day, you’ll also be detoxing your home – the products you use, everything from kitchen cleaning products to cosmetics. This is so essential. We often focus entirely on what we put in our bodies when we detox, but we don’t think of what we’re putting on our body in the shower in the morning, or on our skin when we wash the dishes or do the laundry. Women, especially, are exposed to so many endocrine-disruptive chemicals throughout the day. It’s just as important to detox and cleanse your personal environment. Adding in a micronutrient boost with the right supplements can take your detox to the next level. I highly recommend incorporating the Balance by FLO Living Hormone Supplements to your detox. You can find out more about those here. Is it ok to do this while breastfeeding? You do not want to cleanse while pregnant or nursing. Is there an optimum time in the monthly cycle to do the detox? Follicular is a great time to cleanse! Hi Alisa and the team! I did this detox a couple of years back and I got really hangry from the fruit salad in the morning. The rest of the food I felt great about. I am wondering what I should do if I am starting again once I am in my follicular phase (just entered my menstrual phase). I do occasionally struggle with blood sugar falls / being hangry so it’s something I really wanna avoid. I do not know if anything else might affected it at the time. Do you have any advice going forward? If you are feeling unwell, please stop the cleanse. Snacking should be a regular part of the cleanse, you should never be hungry. How often do you recommend to do the detox? It feels like no matter how healthy i eat, my symptoms always come back. You can do the detox up to 2 times per year. If you are having issues that persist, you want to look at daily eating habits, stress and other factors! You can find more resources on the website! Let my team know how they can help! I’m on day three of the cleanse and have been bloated/uncomfortably gassy the whole time. I’m passing some…gnarly dark green/semi solid matter in surprisingly small amounts several times a day. I am in discomfort from the amount of bloat I’m experiencing but have followed the protocol exactly (including the mindfulness, chewing guide, self care, and journal suggestions) with no suggested supplement left un-purchased. I’m not hungry (am eating more on this cleanse than I normally do) and have good energy. I’m drinking so much water the state of CA may write me a citation soon (~100oz a day not counting unsweetened detox teas/morning lemon water). Skin looks okay though I did have a couple pimples pop up last night. I guess I would describe this feeling as a sense of constipation confused by diarrhea reality? Sorry if that’s TMI. If it’s relevant, I’m on the 3rd day of my luteal phase. minimal amount ccaffeine while I’m on the cleanse. Specifically, caffeine from mushroom coffee or matcha? It’s best to eliminate caffeine for the cleanse. I’m on day 3 of the cleanse, and on day 2 I started with a sore throat that seems to be getting worse. I also have major brain fog. Are these normal symptoms? Hi Ash, Brain fog is very common. You may also be getting sick, which may be separate. In any case, rest a lot! I’m on my second day of the cleanse and I feel very far from emotionally light or happy. I’m hungry very often. No change in my bowel movements (which seem to have been good before). I have been feeling very depressed sense starting the cleanse. I’m not seeing a difference and I don’t know if I should continue. Cleansing doesn’t always feel good in the beginning. However, if you are hungry please eat! You can eat as much of the recommended foods as you need, this is not about starving ourselves! If you are feeling unwell, then please taper the cleanse off by slowly introducing non cleanse foods. I have been using your cycle tracker app for over a year, have stopped using the pill thanks to your book and influence, and just finished the 4 day detox. I am looking to apply some of the detox eating habits/practices/style to my routine lifestyle. I am also trying to regulate my period (It has never been regular, which was part of why I tried the pill). I feel very good after the detox and am wondering where I can read more about the purpose of low protein and high sugar breakfasts for the first 3 days of the detox, and other strategic concentrations of protein or carbs throughout the rest of the cleanse. I am looking for support with how to transition into daily life outside of the detox. This is especially because I have been in treatment for an eating disorder in the past. I have recovered but am looking to maintain balance while also supporting my cycle. Once the cleanse is done, start including eggs, avocados, more nuts/seeds into your diet. You can also have some fish for protein. You do not want to continue with the cleanse after the allotted time – it is not meant as an every day diet. After a few days of having more fats and protein from the foods mentioned above, you can start to include more animal protein. Please refer to my book, the WomanCode, to learn more about how to support your hormones with foods, and how to feed yourself depending on which phase you are in! Keep up the great work! Just not sure when to start as I’m still getting bouts of weakness/exhaustion. Feeling of low blood pressure or like I could pass out ..a cleanse is generally meant to be done when you’re feeling full strength but the reason I’m feeling the weakness etc is because of the hormones I’m be still. So wondering if I should do it now? No, I would not cleanse now. You do want to heal adrenals and build first! I am on Day 1 of the cleanse and I am wondering if I can have snack between breakfast and lunch. Any mention of a snack is from 3pm-4pm but I’m not sure if I will make it to lunch! Snacks are so important to keep blood sugar stable! So yes! Eat as much as you need of the recommended foods. Don’t go hungry. Hi there! is there an optimal phase of your cycle for starting this detox? I am on day 2 and am feeling so much “brain fog” and a general lack of motivation. Is this normal? Yes Catherine! This is very normal! Hang in there!